The Dartmouth ski team’s season came to an end with a fourth place finish at the NCAA Skiing Championships on March 9 at the Trapp Family Lodge and Stowe Mountain Resort in Vermont. After playing seven games in three states and two countries in one month, the men’s basketball team is currently 9-7 with a 0.562 win percentage. Football The Big Green traveled to Ithaca, New York, this past weekend to take on Cornell University. Dartmouth Nutritionist: Shira Evans At the Division I level, it’s easy to get exhausted with such a demanding athletic and academic schedule. Caitlyn McGovern '21 and Lili Stern '22 examine five Dartmouth sports artifacts kept in Rauner Library. Field Hockey Despite out-shooting Yale University (6-6, 2-2 Ivy) 25-9, the Dartmouth field hockey team (4-7, 1-3 Ivy) fell to the Bulldogs 4-3 at home on Saturday. Decades ago, many colleges required students to pass a swim test in order to graduate. Today, only a few cling to this tradition, Dartmouth being one of them. 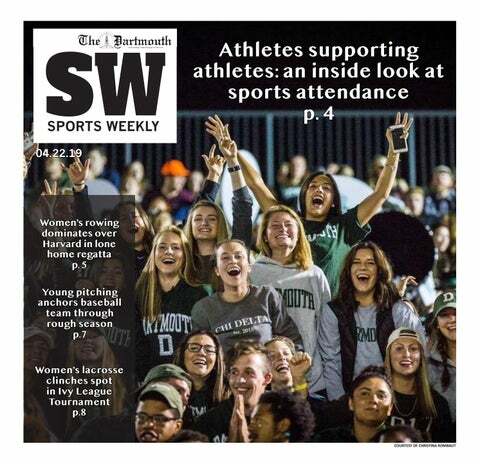 Dartmouth women’s rugby took down three-time defending national champions Quinnipiac University 40-22 in Hamden, Connecticut on Saturday, Sept. This year the men’s soccer teams will bid farewell to its three graduating seniors: Wyatt Omsberg , Matt Danilack and Tyler Dowse , who have won four consecutive Ivy League titles over the course of their athletic careers . Their impact on the program has been immense, with the team finishing at the very bottom of the Ivy League in 2013 and finding itself at the top after their arrival in 2014 . This past season, the three seniors served as co-captains, finishing off their Dartmouth soccer careers without ever knowing what it’s like to be anything but the best in the Ivy League . With a record of 12-3-2 this past season , the team had an average of 11.76 shots and 1.82 goals per game while they held their opponents to on average of 0.71 goals . In total, the team allowed 12 goals the entire season and recorded 10 shutouts.